This is a company house for the local managing director of a very large and diverse multinational corporation dating back to the first half of the nineteenth century – and this makes the house an intriguing addition to the history of the region. While it exemplifies a number of noteworthy environmentally sustainable strategies, it is the house’s role in sustaining cultural and historical continuity that makes it particularly interesting, together with the fact that it is a beautifully resolved house on an outstanding site. The key design idea was to reinvent the colonial black-and white house as a contemporary company house. In this way, the house would not simply be just another Good Class Bungalow (over 1400 square metres in plot size) for a transient expatriate executive – but be part of an evolving history and its place, not just literally in the way it responds to its site and the climate, but also metaphorically in the way it reflects its cultural ‘place’. This, then, is analogous to the black-and-white house. Families would come for, say, a five-year tour of duty and then move on to be replaced by the next family, but the house remained as the constant denominator, accumulating in some intangible way its own history and contributing to the history of Singapore. Despite its name-and the ‘Tudorbethan’ decorative elements that name reflects-the black-and-white house was, in fact, an intelligent response to living in a tropical climate and its design is an eclectic mix of local and Indian vernacular traditions with various colonial adaptations of those traditions. This house needed to be both a family home and an entertainment venue. The private and the public areas are well defined. In fact, guests do not need to go through the main house. The long side of the L shape is a family wing. 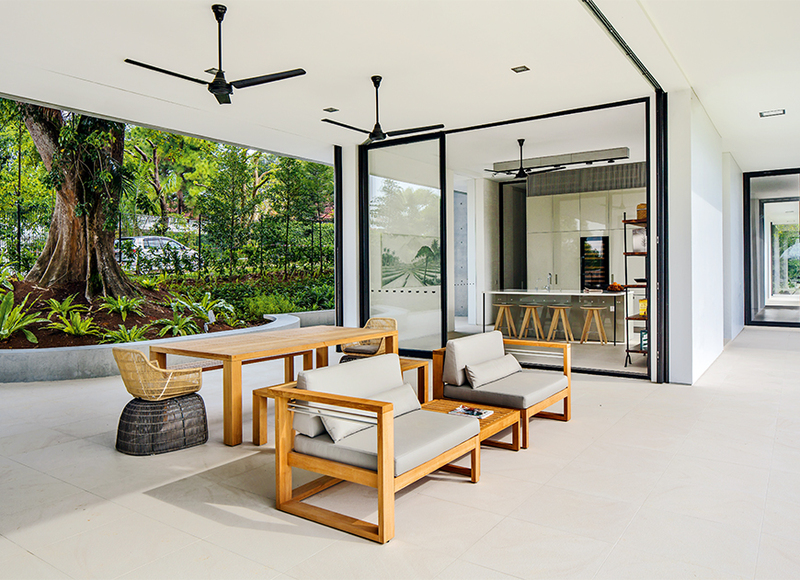 On the courtyard level, this consists of a pantry leading to a completely open terrace and then to an enclosed family room, which can also be opened up completely to the garden. 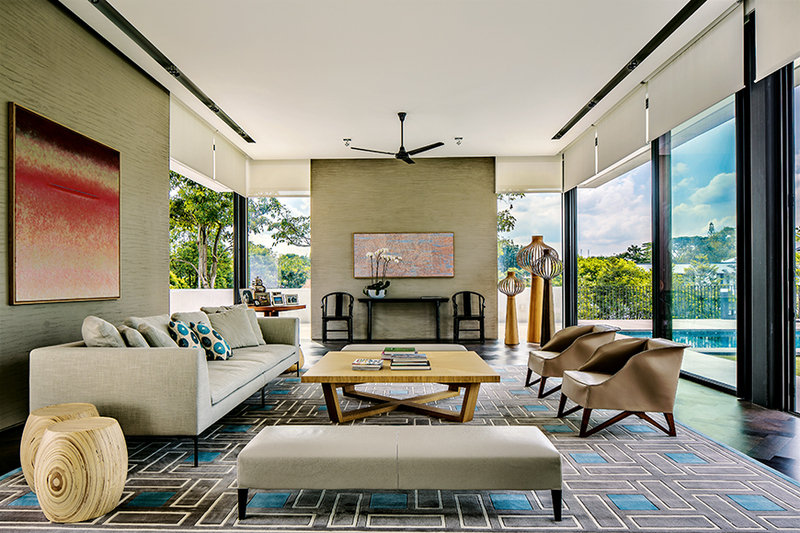 This sequence of spaces recalls the deeply shaded recesses of colonial verandahs where interiors and exteriors merged to create an effortless elegant form of tropical living without air-conditioning. The family bedrooms are on the upper level of this wing, which is just one room deep. The highlight of the public domain is the outdoor entertainment deck located above the main living space. Here, a cabana leads out to a timber deck-actually a green mark product of recycled plastic and woodchip-with a perimeter water feature and garden and sensational views down into the lower courtyard and across the neighbourhood. This is a house that combines environmentally sustainable features-extensive use of natural light, cross-ventilation, indoor/outdoor living and recycled materials-with a subtle celebration of cultural continuity. 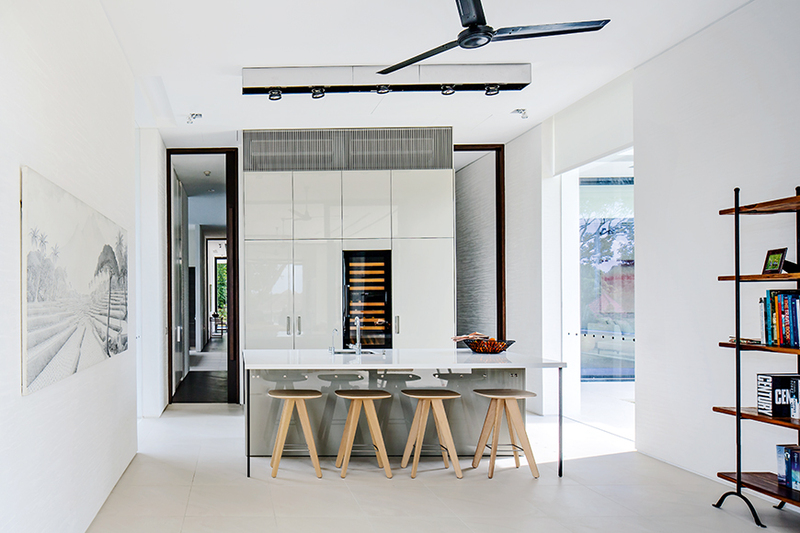 Like the black-and-white house it takes its inspiration from, it sustains a sense of connection with the past and with a tradition that has helped form contemporary Singapore. This article was published in the May 2016 issue of Inspire Living Magazine. Download it here!